Anyone who has a hardwood floor knows how convenient a hardwood floor vacuum can be. Finding a lightweight hardwood floor vacuum is getting easier since they are becoming more popular. The Bissell 1683A Trilogy Superlight Hard Floor Vacuum may be one of the best on the market, though. The neat thing about this vacuum is its ability to transform into different types of vacuums. It can clean hardwood floors just as well as some carpeted areas and rugs. You can also quickly and easily convert it from an upright vacuum to a handheld vacuum. Since this vacuum allows you to do so much, it is considered to be one of the most versatile vacuum cleaners on the market! The absolute best thing about this vacuum cleaner is that it can serve as your regular vacuum and your handheld vacuum that you use for small cleanups. One of the reasons why people don’t clean as often as they should is because it can be a hassle to get a heavy vacuum cleaner out. That problem is eliminated when you have the Bissell 1683A Trilogy Superlight Hard Floor Vacuum. Included with your purchase is an extension wand, hardwood floor glider, upholstery and crevice tool, storage hook and a dusting brush. Most people like this vacuum because they can use it to clean up a quick mess or spill, or they can get it out to vacuum the floors in the entire house. However you decide to use it is up to you, but be sure to get it from Amazon quickly! 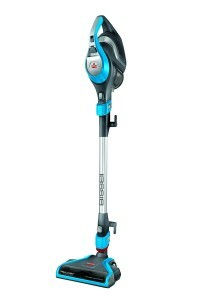 The number one thing that people don’t like about the Bissell 1683A Trilogy Superlight Hard Floor Vacuum is the design. It won’t stand up on its own, meaning you have to put it on a hook in a closet or storage room, and you can’t lean it up against a wall or door while you move furniture or objects. Also, the dirt storage cup is pretty small, so if you are cleaning a large area, then you may have to empty the dirt cup several times. The dirt cup also isn’t in a very easy location on the vacuum and can be inconvenient to empty. Finally, this vacuum doesn’t do very well with pet hair. It can pick up fine dust particles, but pet hair gives it some problems. If you have a pet that comes into your home, then you will likely have to go back over your floors and pick up the hair that the vacuum missed. 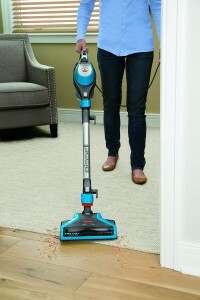 The Bissell Trilogy vacuum is perfect for anyone who wants a lightweight vacuum that can perform a variety of functions. It is powerful enough to pick up everyday dust and dirt, and as long as you vacuum on a regular basis, this vacuum should be more than enough for what you need in your home. Whether you primarily have hardwood floors or different types of surfaces, the Bissell Trilogy can get the job done for you. Since it comes with pretty much all of the attachments that you will ever need, you shouldn’t have to buy anything extra when you order this vacuum. What’s so Good About the Bissell Brand? Bissell was founded in 1876 and is based in the United States. It is one of the top companies in the United States in terms of sales in the floor care industry. They put all of their efforts into setting their products apart from the competition. When the company started, they just had a single sweeper, but they have expanded their footprint in the industry to become one of the giants and leaders worldwide in the floor care industry.